Spring flowers are beginning to appear everywhere! The weather has turned colder now again but spring is still certainly on the way – here are just a few of the species to be seen around Grantham at the moment, there will be many more to come! This is a typical component of hedgerows throughout the country and there are plenty of examples of it aroung Grantham. Most of them are not yet in flower but this specimen growing on its own beside the river seems to be at the head of the pack! 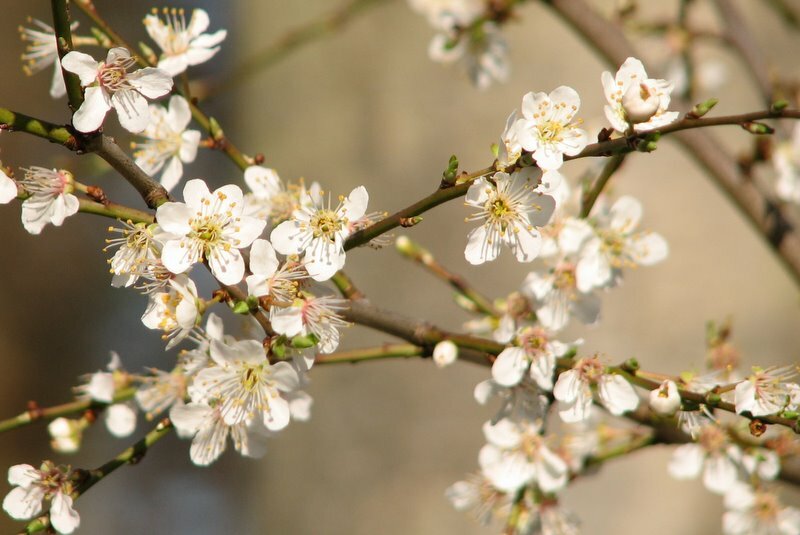 Start looking out for the white patches in the hedgerows around now – blackthorn comes into flower before its leaves unfurl which makes for a beautiful spring sight with a mass of creamy white blooms. You may know blackthorn as sloe – the small purple plum-like fruits which can be used to make sloe gin, jam and, well, little else. These are generally harvested after the first frost of autumn so it will be a long time before these flowers produce ripe fruits. This is another non-native but very welcome spring flower. There are two native species of cherry tree – wild and bird – but the majority of those you are likely to see around are ornamental varieties. This one is growing on Sandon Road, outside of the construction college but you can see them flowering in gardens and public spaced throughout Grantham, including the town centre. 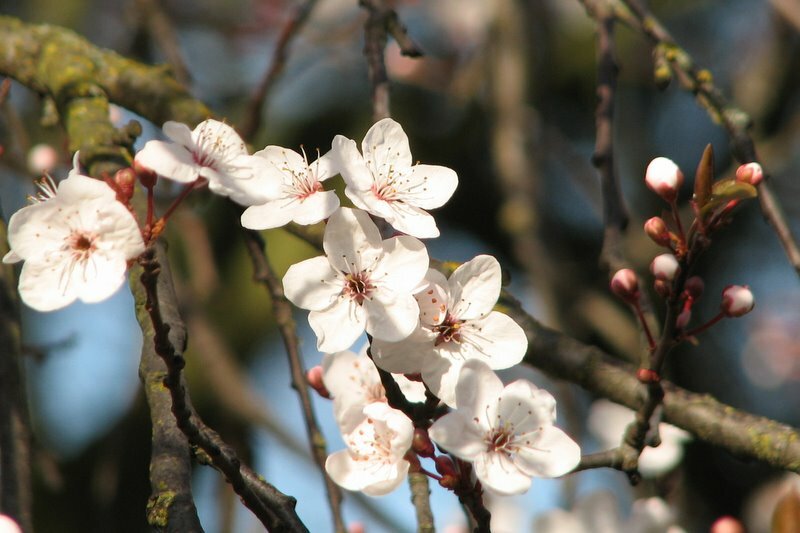 You might notice how similar the cherry and the blackthorn flowers are – they are in fact in the same genus, the prunus. This genus includes all of the cherries including familiar fruits – cherry of course, apricot, peach and plum, as well as almonds which are effectively the stone you might be familiar with and not, therefore, a true nut. Cherry blossom viewing is one of the highlights of the year in Japan – they have blossom viewing parties and events and there are even forcasts which predict when the blossom will be in its fullest glory around the country, depending upon geographic location and weather conditions. I’m not aware that this has caught on to the same extant here in Grantham, but the flurry of whites and pinks certainly do cheer up the town as you walk through. One of the most widely recognised spring flowers, these are generally considered to be a naturalised rather than a native species. They are found as natives across Europe and certainly fend for themselves in this country but the first recorded colonies were in the 1770’s *. It is possible that some plants are native however, especially in the south of England, however these on the bank of Grantham College are almost certainly planted. One of the earliest spring flowers, they are probably coming to an end now as the weather begins to warm. You do get many cultivars and ornamental varieties too – if you want to see a nice display, Easton Walled Gardens, just along the A1 south of Grantham, has a snowdrop week once a year, however you’ll have to wait until next year for the next one! 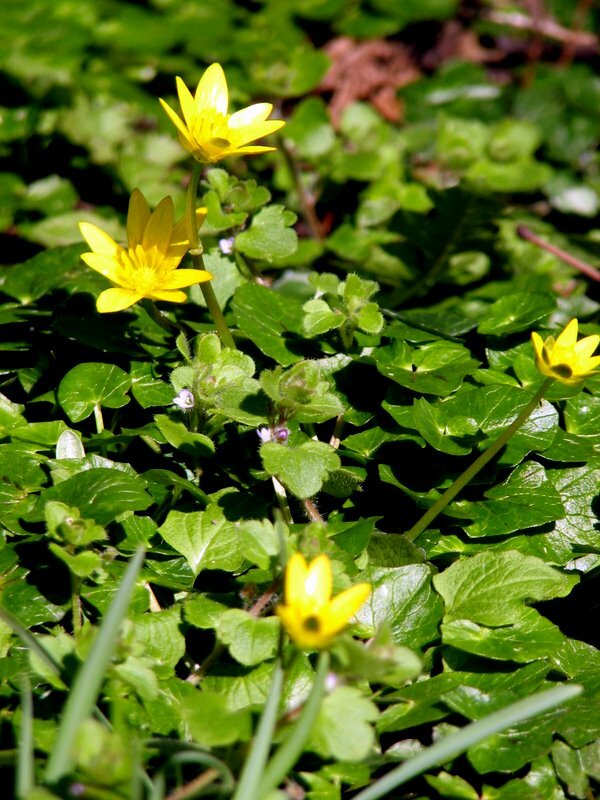 This is a small native species in the same family as the buttercup – the Ranunculus family. The small yellow flowers are another characteristic of early spring and grow in abundance due to their habit of spreading by rhizomes as well as seed. They are most apparent on warm sunny days such as this as they are only open during daylight and close up when it is dark or overcast. They can be found in many places – they are often present in woodlands or along the bases of hedges where they can spread out into adjacent grasslands. 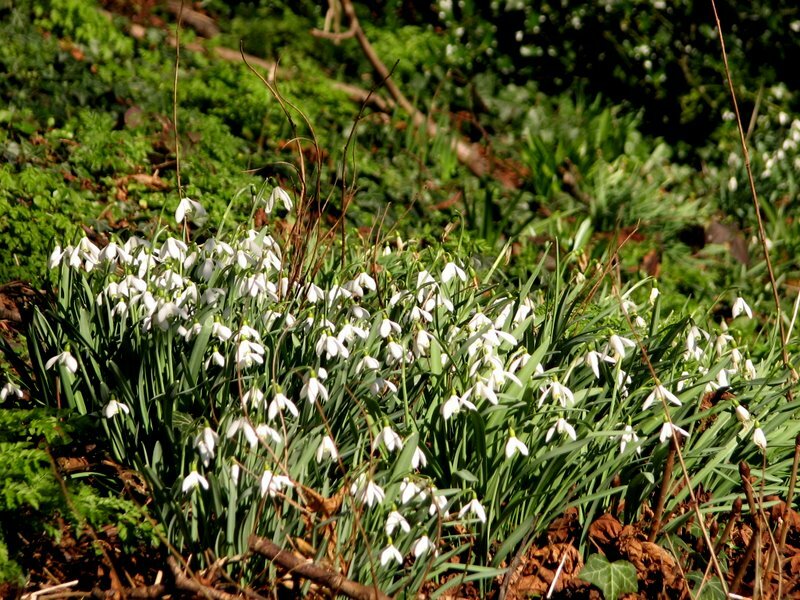 They bloom early in the year, preceding the trees coming into leaf – when they grow beneath a wooded canopy, spring is the time when they will get the maximum amount of light. The plant will die back in May and then remain dormant for much of the remainder of the year. These flowers were growing alongside the snowdrops on the bank of the college on Stonebridge Road. As an extra bonus, which I didn’t even notice until uploading this picture, is a tiny little ivy-leaved speedwell (Veronica hederifolia) growing within the celendine patch – see closeup below! You can see where it derives its name from too and, in this case, the latin is a very good reflection of the English. Hedera is the ivy family and folia derives from the latin for leaf; hence ivy-leaved. 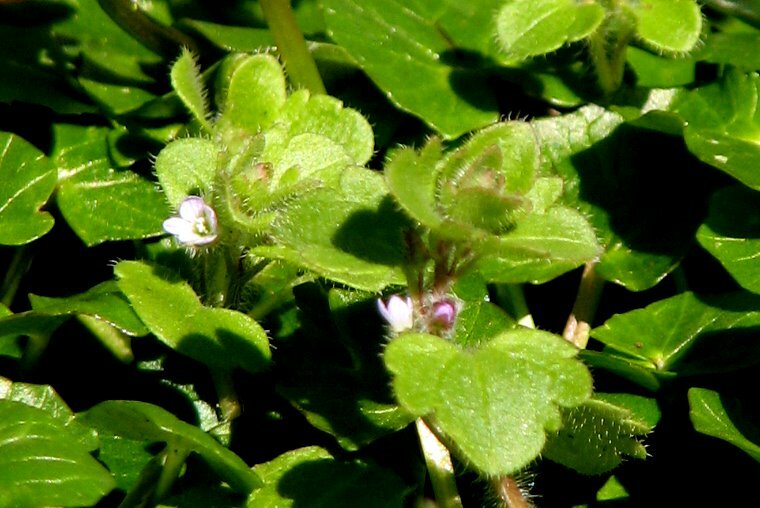 Veronica is the family name of the speedwells.. This species generally flowers in April – May but it must have found particuarly favourable conditions settled in amongst the celendines.